When it comes to working out, getting started is the hardest, yet most rewarding part. Beginning and sticking to a good workout regime will leave you feeling accomplished, but if we continue to do the same movements at the same level, our body’s will plateau and those results won’t seem so drastic anymore. Boosting the intensity of your workouts is a great way to ensure you are getting the optimal output. This could mean anything from adding more weight, doing more sets/reps, reducing rest time, etc. Someone who is very familiar with intense workout regimes is Dr. Joel Seedman. His knowledge on the human body and how intensity and plateauing affect it is astronomical. With over 13 years of personal and team training, strength coaching, and nutritional counseling experience, Dr. Joel Seedman works with a wide variety of clientele–from amateur to professional athletes, and from adolescent to elderly individuals. Dr. Seedman takes a holistic approach to training, incorporating the best of neuromuscular physiology, motor learning, exercise physiology, sports nutrition and supplementation, bio-mechanics, sport psychology, bioenergetics, arthrokinematics, and functional anatomy to aid his clients. In order to maximize performance and health, Dr. Seedman focuses on improve his clients’ muscle function and movement mechanics. By doing this, all characteristics of performance, fitness, and health improve-no matter the athlete or training goal. You can learn more about Dr. Joel Seedman here! You have the more traditional quantitative factors that increased training intensity such as high intensity protocols designed to push the muscles past their usual point of fatigue. This includes drop sets (strip sets), forced reps, partials, and holds. Also, bio-mechanical drop sets are one of my favorite, where you perform a particular exercise with a given load such as a front squat, hit your target reps or reach failure or fatigue, then keeping the same weight immediately proceed into back squats. So almost like a super-set but using the same load with really no break, just moving from a more bio-mechanically difficult position to a more bio-mechanically advantageous position. It’s a great way to quickly extend a set and increase the demands on your targeted musculature while also hitting the muscle group from different angles and positions. However, if I had to chose one technique that trumps all other methods for increasing exercise intensity it would be cleaning up your lifting technique and form. It may sound a bit odd to include this as a means of increasing exercise intensity but this is without a doubt the single most effective intensity training technique an individual can utilize. Cleaning up your form and technique not only reduces stress on the joints and connective tissue but it’s unbelievably intense and brutal on the targeted musculature not to mention your overall conditioning and cardiovascular system as it requires enormous effort, mental toughness, full body tension, body control, and energy. Unfortunately most people substitute exercise quality for exercise quantity as they’re so focused on increased training intensity and overall work that form goes out the window. Ironically improving exercise quality is the single most effective training strategy one can use to increase the intensity and energy expenditure of their training. The typical cardio activity starts slow and then builds up to a higher speed, then slows down at the end before stopping. A great way for beginners to increase the time spent at higher intensities is to gradually incorporate more waves of higher and lower speeds. This can get you used to the idea of slowing down instead of stopping when you get tired, so you can decrease rest time. Negative training is used for both beginner and advanced gymaholics looking to improve their skills. It relies on gravity or another person to do some of the work for you, so you can complete at least half of a rep of an exercise you can’t normally do. If you can’t do a pull up, you can boost yourself up above the bar and fight gravity on the way down to complete the second half of the rep on your own. Doing this can build up strength (for beginners) so you can eventually start without the initial boost, lifting yourself cleanly to the bar and then back down again. You can also use this for weights, having a trainer or a partner with you to start the rep for you and have you finish it, either on the last few reps that you can’t quite do (beginners & advanced), or for an entire set (more advanced). Your rep range should reflect your fitness goals. For strength goals, your sets should be built on 3-5 reps. For muscle-building goals, stick to 8-12 reps. For muscular endurance, try 12-15 reps. For hypertrophy (muscle-building) goals, the last couple of reps per set should be damn near impossible. In reality, a great way to determine if you’re lifting heavy enough is to see if you’re reaching failure on each set. If you can get to 15 reps easily, then those dumbbells are too light! Never underestimate the power of heavy weight. If you’re not using challenging weight, there’s no way you’re stressing your muscles enough to make any change. It takes power output to move weight, so make sure yours is on the high end! To grow, your muscles have to be stressed. The amount of stress you can provide on your muscles is important. If you train your muscles for too long, you run the risk of injury and overtraining. If you don’t give them enough time under tension (TUT), you may be not be getting the gains you want. TUT is the total amount of work you put on the muscle, or the total time your muscle resists weights during a set. You can change the length of your set for particular goals. For strength goals, the amount of TUT per set is about 20 seconds. 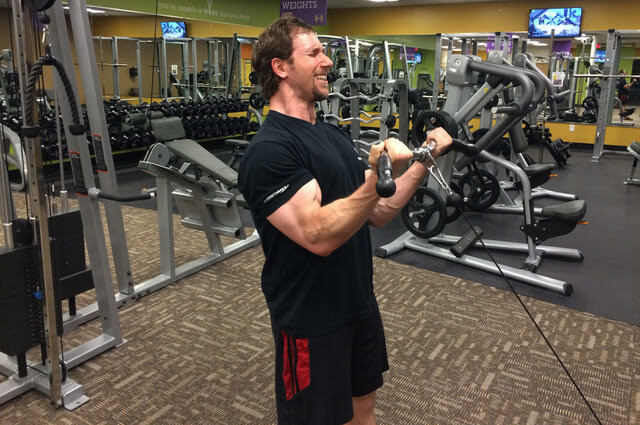 For hypertrophy, you want to be somewhere around 40 seconds. For muscular endurance, you’re looking at about 70 seconds.